MSI WindPad 100A is a tablet model spotted back in the days of CES 2011, while the WindPad 110W is a MSI device that was showcased at CeBIT. They’re both present in Taipei, as part of the Computex 2011 event, on the MSI floor. There’s also a newcomer, the MSI WindPad 120W. While the WindPad 100A is a 10 inch Tegra 2 dual core tablet with Gingerbread now and Honeycomb, the 120W packs the same chassis, display diagonal, but opts for the surprising Intel Cedar Trail, instead of the AMD Fusion APU. WiDi and HSPA wireless are also o board of this newcomer, that interested us more than the other MSI products. With ARM and Android making waves in the mobile device segment, Intel surely wants to have a say on this market. OK, so maybe Nokia has been slowing them down, but that’s no reason to not get to business ASAP, right? Computex 2011 is the perfect time to showcase some Oak Trail Honeycomb slates, like the ones below. What you see here are prototypes, with 10 inch displays and the models in the image above are the Intel Green Ridge, Foxconn F150, Quanta QXZI, a mystery Compal device without a name, Intel Marco Polo 2 and Intel Carrot. The chipmaker didn’t provide the names of ODMs behind this references designs, so it’s all guessing games. In spite of the recent problems between RIM and its investors, the company is still planning to give PlayBook a couple of successors. Among those we find a WiMAX-enabled version of the slate, that has been recently spotted in a Google Search as shown below. This 4G version of the tablet is mentioned in a mere placeholder right now, so there’s no real information to work with. The PlayBook should have shipped from Sprint on April 19, but the date was pushed to May 8 and once again to an unmentioned date. This device is based on QNX OS, a platform that we’re going to see on BlackBerry phones in the future. Reviews of the PlayBook have been mixed till now, most of them mentioning the lack of apps supported by QNX. The good thing is that apparently, Android apps will also be supported on the tablet in the future. The tablet has been having a number of problems, like the recent recall of the 16GB model from the Staples. Computex 2011 is an opportunity to not only check out the latest of tablets, but also get some hands on quality time with some tablets that we already knew of. 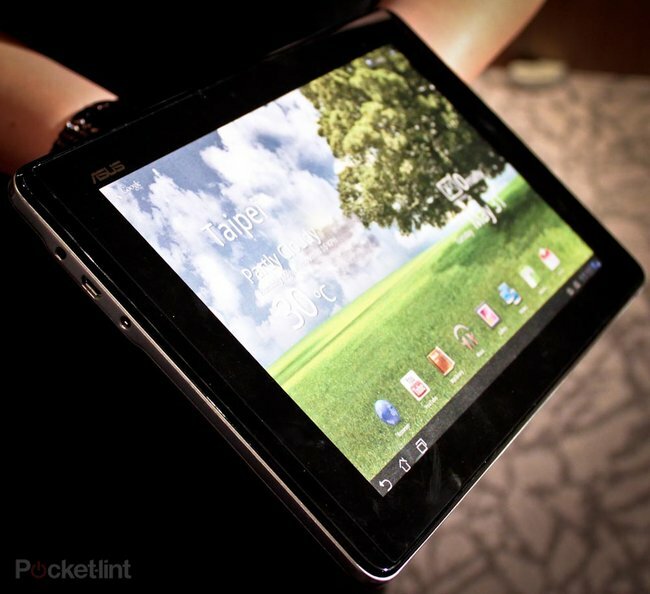 Among them we can see the ASUS Eee Pad Slider, announced earlier this year. The product has yet to be available internationally, although it should be coming this summer. The device packs a 10.1 inch LED Backlight IPS multitouch screen, with a 1280 x 800 pixel resolution, Gorilla Glass protection and Android 3.0 Honeycomb as the OS. The core of the unit is a Tegra 2 CPU and you get 16/32GB of memory, if you’re wondering about storage. Also dubbed SL101, the Eee Pad Slider got praises for its build quality, at least from the guys at Akihabara News. This is considered a multipurpose tablet, with a comfortable keyboard and a better choice even when compared to the Eee Pad Transformer, according to the people who tested the device. Shuttle just introduced three new tablets at Computex 2011, all of them based on Android. There’s a 10 inch WXGA model called N10CN1, a 9 inch XGA one called N09CN01 and an 8 inch SVGA unit dubbed V08CT01. The first two rely on Nvidia’s Tegra 2 dual core processor, plus 1GB of RAM. The smaller unit is a rugged slate for education and comes with a 800 MHz TI Cortex A8 single core CPU and 512MB of RAM. These are all Froyo models in prototype phase, so there’s no pricing and launch date for these units yet. The N10 model supports Bluetooth tethering, while the V08 series comes with anti-shock and anti-vibration features. Let’s see what else is in store at Computex 2011 this week. MSI is another one of the big brands present at Computex 2011, showcasing some budget tablets, among others. We’re talking about the MSI WindPad Enjoy 10 and the WindPad 7, both priced below $300. These models run Gingerbread and we sure hope they’re scheduled for a Honeycomb update. WindPad Enjoy 10 comes with a 10 inch display with a 1024 x 768 pixel resolution, 4GB of internal memory and 512MB of RAM. The price for this product is $299 and its core is a 1.2GHz ARM Cortex A8 single core CPU, supposedly able to play 1080p video. Dual 2MP cameras are also on board. The smaller unit, Enjoy 7 packs a 7 inch display with a 800 x 480 pixel resolution and much the same specs as the bigger slate. The price point of this device is supposed to be even lower and we’re to expect mass production of both models in July. The States will get these devices in July or soon after. Is it a phone, or is it a tablet? Well actually, it has the power to be both. That’s the story of the PadFone, a new gadget that’s been announced by Asus at Computex in Taipei, and as you would expect we’ve tracked down the device to see what’s what up close and personal. Still those small details aside, we do have plenty to share thanks to a chatty demo girl who shared some titbits with us and a model that kinda worked.? Firstly the rear flap won't look like it does now. Secondly instead of two connectors there might only be one for docking it with the tablet part and that's part of why they're not talking specs at all. The unit they had wasn't working, so it's really hard to say much at all about it and of course the other problem is that Android isn't where it needs to be right now – ie Ice Cream Sandwich isn’t available yet. That’s going to be the important ingredient for the tablet and the phone to talk to each other even though the tablet is likely to be a dumb screen. From what we understand the switching part will be part of the OS, so it should work with other devices like the PadFone. That means it's not a custom Asus feature, but something Android is developing - exciting. From what we’ve seen we’re sceptical about how seamless it'll be. Asus suggest that you just plonk the phone into the tablet and everything will just work, but in tablet mode instead of phone mode. Oh, and remember the Asus Garmin deal of yesteryear? It'll ship with Garmin’s navigation software according to our demo girl, as that deal still stands. As for when it is likely to be available? We've told expect it in the shops for Christmas.? In these Computex 2011 days, ASUS seems to be one of the major players on the floor in Taipei. Fresh after revealing the ASUS Padfone, the company also detailed the Eee Pad MeMO tablet. This device comes with a 3D display, as confirmed by Jonney Shih, an ASUS official. The display on this device is a glassless 3D IPS, capable of a 1280 x 800 pixel resolution and it measures 7 inch in diagonal. The slate runs Honeycomb and it will now be known as Eee Pad MeMO 3D. There’s also a MeMIC Bluetooth headset bundled with the product and if you’re wondering about prices and launch dates, you’re out of luck. MeMO is a portrait-oriented device that supports stylus input and recognizes handwritting. The bundled handsfree headset allows the user to make calls and listen to music. Once you turn the tablet into landscape mode, it becomes a 3D display, ideal for games and video viewing. Google is very excited by the Asus Padfone; the company's corporate VP and GM for the Personal Mobile Devices Business Unit, Benson Lin, has told Pocket-lint in an exclusive interview at Computex in Taipei. “We are working very closely with Google and they are excited by the PadFone,” Lin tells us with excitement. The Asus PadFone, launched at the start of Computex 2011, takes the concept first debuted by Israeli firm Modu whereby the smartphone acts as the central computing unit for a tablet jacket. In the case of the Asus PadFone, there are two parts: a 4.3-inch Android powered smartphone and a 10.1-inch tablet, which can be used to expand the screen size when it comes to watching movies. There’s no surprise that Google is excited. It recently bought Modu’s patents after the company went broke earlier this year, suggesting that Asus might be using those newly bought permissions to create devices like the PadFone. Due out at Christmas, Lin tells us, the biggest problem, and therefore delay, is that it’s waiting for Google to release its Ice Cream Sandwich?version of Android as it holds the key to the seamless switching between the phone and tablet modes. Google has ICS confirmed before Christmas, bringing a closer unity between its phone operating system (currently Android 2.3.3) and its tablet operating system (currently Android 3.1). But it’s not just Google who wants the PadFone, Lin explains. Add that to tablets and smartphones having very different usage scenarios and Asus claims that consumers are three times as likely to access the Internet on a tablet as on a smartphone. There’s of course also a matter of cost, and the PadFone should be more affordable than buying both a tablet and a smartphone claims Lin. Asus usage scenario for the phone part for the PadFone includes using it for making phone calls, sending text and multimedia messages, checking email, using it for instant messaging and listening to music on the go - so basically everything that you use a smartphone for really - while the tablet part fulfils the same wants: Internet access, video conferencing, entertainment, replying to emails and some productivity tasks. If that all sounds exciting, Asus has hinted to us that this is just the start. The PadFone is potentially just one device in a new echo system and it’s very possible that Asus will offer new handsets that will allow users to keep the tablet while upgrading the phone part, which of course contains all the important hardware. Asus wouldn’t tell us much with regards to the hardware features, but suggested that it was the same as the latest “super phones” from HTC, Samsung et al. As such Asus is intending to push the tablet part as the differentiator in the market. The hope is not only to win over consumers to the PadFone, but also network operators, as Asus believes that consumers will use more data services with the PadFone due to the tablet part. We should also be seeing other devices from Asus personal mobile devices group in the future as well Lin tells us, but not right now as Asus is focused on Android for smartphones. That’s despite having had a past relationship with Microsoft, suggesting that Asus isn’t about to launch a Windows Phone 7 smartphone any time soon even though it made developer models for the company. Bad news for MeeGo. Asus might have launched a MeeGo-powered laptop at the show, but Lin confirmed there is no plans to release a MeeGo tablets for now. Gigabyte S1080 is a new Windows 7 tablet, that brings forth a surprising dock, featuring an optical drive. The slate measures 14.94mm, which is rather thick, considering the iPad 2 is a mere 8.8mm in waistline. Gigabyte announced the new product today during the Computex 2011 pre-show. The S1080 comes with a 10.1 inch capacitive touchscreen LCD, the Intel Atom N570 CPU, 2GB of DDR3 RAM and a 320GB HDD (5400rpm, SATA). Other feats include a USB 2.0 port, a USB 3.0 port, SD card reader and RJ-45 jack. There’s also a 1.3 megapixel webcam and a 4,000mAh powering the entire device. Bluetooth 3.0 and WiFi 802.11 b/g/n provide connectivity, together with a 3.5G modem. This machine weighs 895 grams and it comes with the interesting dock mentioned above, that packs in stereo speakers, VGA output, 3 USB 2.o ports, audio line in and an optical drive, which is rare nowadays. The price tag for the S1080 is $700 and the date of arrival in the States is June.